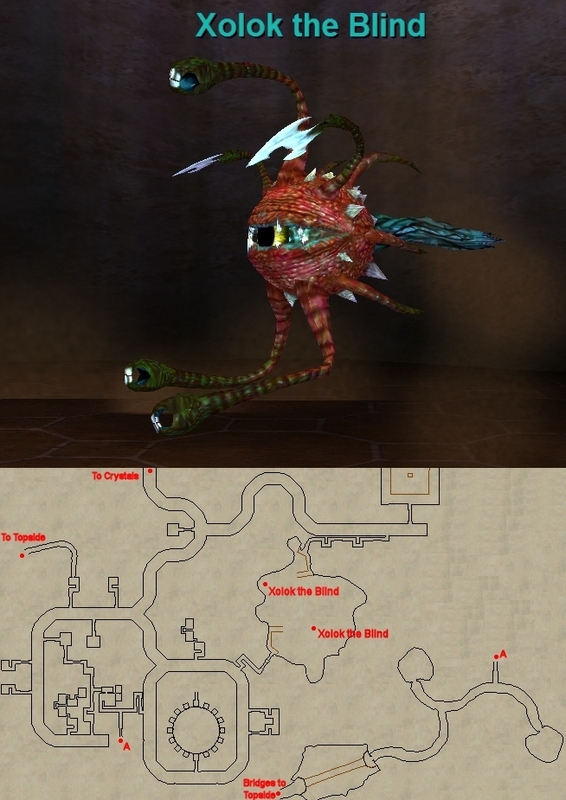 Xolok the Blind has a significant damage aura 40' range around it (does approximately 21,000 hp dmg per second). It does not summon. Every 35 seconds, it selects a random player on its hate list to follow around. From there, it makes a check every 15 seconds: If, at the time of this check, its target is less than 75' range away, it casts "Fateful Entrapment" on that target (roots the player in place - 1 tick). If its target is more than 110' range away, it casts "Fateful Draw" (pulls the player into its aura - 1-tick pull). This page last modified 2012-12-30 19:31:43. Seriously tough mob. All evil eyes are a pain, not the least of all because they see thru invis. This one must have been a beeyutch to kill "back in the day," I could not molo him so I brought in my war, enc and druid and summoned THREE cleric mercs and I still had to keep casting druid group heal to keep everyone alive. No way in group gear I can get our corruption resistance up to the recommended level of 500+. I generally want to solo or molo Hunter Achievement mobs in these older expansions but this one was probably not going to be doable. How did you get your corruption resists so high? Did you swap out AC augs for corruption augs? I was hoping to avoid doing that to tank this mob. Today 2 nercos and 1 pally mastering the art of combat. Killed the Eye with precision casting and and rezzs in a masterful game of chess. Victory to the only 3 man group to kill such a challenging foe. Corruption resists are definitely a way to go on this guy. It took me a few tries, but I got it. I used a SHD/CLR/SHM and 3 wiz mercs to do it. Try #1: 370 corruption resist, was able to survive 20-30 secs here, but the damage was simply landing too fast to keep up. After this, I scoured through my bank and gear to find old corruption augs I had been saving just in case, this included UF/Mckenzie augs, 2 augs from those sewer missions. I was able to replace about 7 augs that otherwise had no corruption resists doing this. I also used Tnexus terrible tasting tea (+5), Quarken Xired's Timeless Trail Rations (+2), Drake of Pure Nature Familiar (+10). I am missing the Tower anniv raid augs, probably why my corruption didn't get as high as Tobynn's. Admittedly this strategy probably won't work if you don't have most the anniversary raid augs, is a ton of corruption resistance to be found there. Try #2: 497 corruption resist,Got Xolok to 40 %, but I positioned my support poorly, he slowly dragged them in one by one until it was just the SK left, so I feigned and regrouped from there. Try #3: 497 corruption resist, was able to position support in Xolok's sweet spot no problem this time. Got eye to about 30-40 % with no problems whatsoever, then he cheated and had a trash eye assist him. It didn't work out for him though, finished named off, then dispatched the trash eye afterwards. Rather easy fight once you figure it out, I have placed my 7 augs in some older gear of mine for those 7 slots, so will simply equip and kill should I feel the need to murder him again. P.S., the named himself does melee for about 20k damage, don't count on only dealing with spell damage if you employ the corruption resist method here. The visible aura around Xolok pulses the spell effect Caustic Discharge, a 35k DD once per second (less spell shielding benefits). That's not per tick, but per second. So while the aura is not a death touch, it will indeed cause your death right quick. That said, with sufficient corruption resist the aura effect can be resisted a great deal of the time. Therefore, Xolok can be tanked and burned via range damage. Note that while Xolok is being tanked, he will not chase other players, however he will still change his target every 30 seconds or so and use his Fateful Draw or Fateful Entrapment on his newly acquired target. This means even though he is being tanked, if his new target is too close or too far he will do his thing and either root them or pull them to him, but he will not give chase. So, even when tanking him its best to position players in the sweet spot distance. I 3-boxed him today for a couple kills using WAR, BST, DRU, plus 1 healer merc and 2 caster mercs. Warrior tanked him with 545 buffed corruption resist. Parsed the log file afterwards, found 419 pulses of Caustic Discharge, of which 267 were resisted entirely (63% resist rate). Of the 152 pulses that actually landed for damage, only 19 were in excess of 8k. Most of the partial resists were far, far less in the 2-4k range. While I have been in on kills with groups that kited him around, trying to kite while 3boxing just wasn't gonna happen! So, I found an alternate solution. Edit: Added some food/drink with corruption resists, new buffed total 554. Resist rate now up to 72% on the most recent two kills. Top partial resist now only 7k.